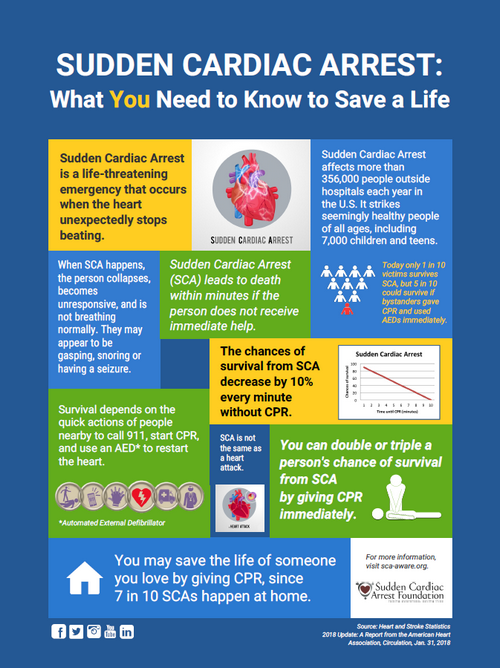 Sudden Cardiac Arrest (SCA) is a life-threatening emergency that occurs when the heart suddenly stops beating. It strikes people of all ages who may seem to be healthy, even children and teens. When SCA happens, the person collapses and doesn’t respond or breathe normally. They may gasp or shake as if having a seizure. SCA leads to death in minutes if the person does not get help right away. Survival depends on people nearby calling 911, starting CPR¹, and using an AED² (if available) as soon as possible. SCA is the third leading cause of death in the U.S. Approximately 356,000 people of all ages experience EMS-assessed out-of-hospital non-traumatic SCA each year and nine out of 10 victims die. When bystanders intervene immediately by giving CPR, survival rates double or triple. ¹CPR: Cardiopulmonary resuscitation is when you push hard and fast on the center of chest to make the heart pump; compressions may be given with or without rescue breaths. ²AED: Automated external defibrillator is a device that analyzes the heart and if it detects a problem may deliver a shock to restart the heart’s normal rhythm. Sudden Cardiac Arrest can result from cardiac causes (abnormalities of the heart muscle or the heart’s electrical system), external causes (drowning, trauma, asphyxia, electrocution, drug overdose, blows to the chest), and other medical causes such as inflammation of the heart muscle due to infection. Sudden Cardiac Arrest is a leading cause of death in the U.S. It affects more than 356,000 adults (356,461 EMS-assessed individuals) outside hospitals each year. Does Sudden Cardiac Arrest mostly affect the elderly? No. While the average Sudden Cardiac Arrest victim is 60-years-old, SCA affects people of all ages—even children and teens. More than 7,000 youth (7,037) under the age of 18 experience SCA each year in the U.S. Does Sudden Cardiac Arrest mostly affect people with a history of heart problems? No. Sudden Cardiac Arrest is often the first indication of a heart problem. Where does Sudden Cardiac Arrest occur? Sudden Cardiac Arrest outside hospitals occurs most often in a home or residence (68.5%), followed by public settings (21%) and nursing homes (10.5%). How often is Sudden Cardiac Arrest witnessed? Sudden Cardiac Arrest outside hospitals is witnessed by a layperson in 37% of cases and by an EMS provider in 12% of cases. For 51% of cases, the collapse is not witnessed. Who survives Sudden Cardiac Arrest? About one in 10 EMS-treated victims of Sudden Cardiac Arrest survives (10.8%-11.4%). However, there are large regional variations in survival to hospital discharge (.8%-22%), which are largely due to bystander intervention with CPR and AEDs. No. A heart attack may be compared to a plumbing problem in the heart, while Sudden Cardiac Arrest may be compared to an electrical problem in the heart. When people have heart attacks, they are awake, their hearts are beating, and they are able to communicate. When people have SCA, they are not awake, their hearts are not beating, and they are unable to communicate. Heart attacks can lead to SCA, but there also are many other causes. Is there anything a bystander can do to help save a life threatened by Sudden Cardiac Arrest? Yes. The chances of survival from Sudden Cardiac Arrest increase dramatically if the victim receives immediate CPR and treatment with a defibrillator. AEDs—increasingly available in public places and homes—are designed for use by laypersons and provide visual and voice prompts. They will not shock the heart unless shocks are needed to restore a healthy heartbeat. Do survivors of cardiac arrest experience any complications? Some survivors of cardiac arrest experience multiple medical problems including impaired consciousness and cognitive deficits. As many as 18% of OHCA survivors have moderate to severe functional impairment at hospital discharge. Functional recovery continues over the first six to 12 months after OHCA in adults. What is the impact of Sudden Cardiac Arrest on society? The estimated societal burden of Sudden Cardiac Arrest in the U.S. was 2 million years of potential life lost for males and 1.3 million potential life lost for females, accounting for 40-50% of the years of potential life lost from all cardiac diseases. Among males, estimated deaths attributed to Sudden Cardiac Arrest exceeded all other individual causes of death, including lung cancer, accidents, chronic lower respiratory disease, cerebrovascular disease, diabetes mellitus, prostate cancer, and colorectal cancer. You can save a life. First, be prepared by learning CPR and how to use an AED. Start CPR. Press hard and fast on the center of the chest at a rate of 100-120 beats per minute. SOURCE: American Heart Association Heart Disease and Stroke Statistics – 2018 Update, Published online in Circulation, Jan. 31, 2018. See Sudden Cardiac Arrest Foundation summary report on new AHA statistics here.